BIRDCAGE PHOTO FRAME DECOR home decor, jewelry, decor, decorations, electronics, fountains, floor mats, art glass, vases, garden essentials, fireplace screens. Simply the most charming way to showcase your family photos! 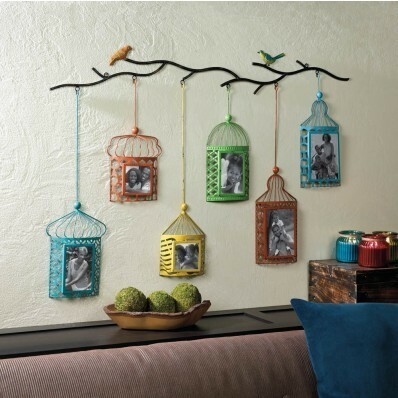 This wall-mounted photo decor features six brightly colored birdcage frames that hang from a branch where two pretty birds are perched. Fits two 4" x 4", two 4" x 6" and two 5" x 7" photos. Material(s): IRON GLASS. Weight 3.8 pounds. Dimensions 46" x 1" x 31".